I made this birthday card for my daughter by cutting the green Baroque swirls-square fold design in the center of this card using the Kirigami paper craft technique. I followed the instructions on the Creating Kirigami book by Carlos N. Molina to cut this intricate design. 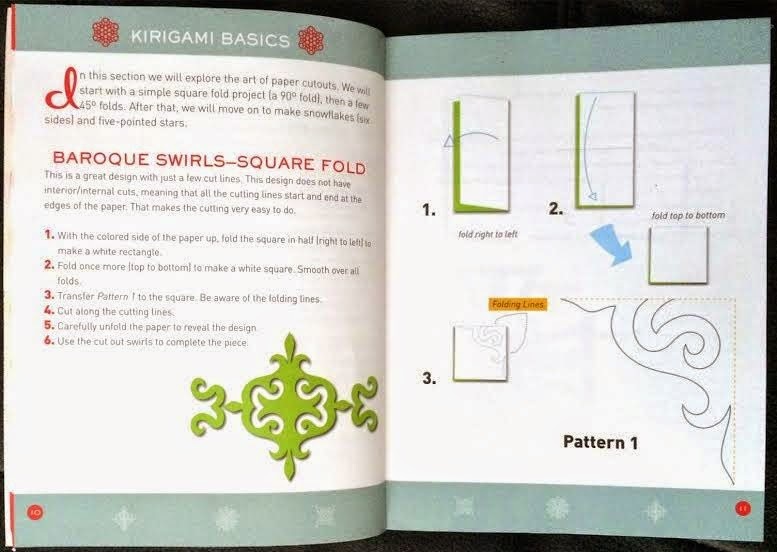 I have never heard of Kirigami before I saw this book, and was curious to find out what it is about, as I enjoy paper crafts. I learned that Kirigami or paper cutting is the art of cutting elegant designs on paper. Kiri in Japanese means to cut and gami means paper. This book explores the possibilities of traditional Kirigami and its modern evolutions. The book helped me learn about the tools needed for this craft, techniques and how to transfer patterns, fold and cut. There are lots of patterns including 3D projects. To cut the Baroque swirls-square fold design click on the image below and see the step-by-step instructions, pattern and picture illustrations. Oh what a creative designs,love to make some designs like this .Belated birthday wishes to ur daughter from our family .